Monday through Saturday, 11 a.m.-10 p.m. and Sunday, 12-10 p.m. 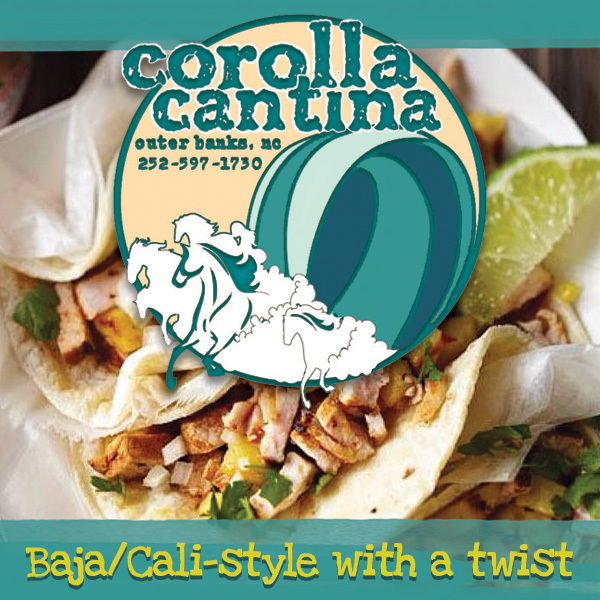 Satisfy your hunger and your taste buds with Corolla Cantina, Corolla's freshest Baja-inspired cantina! Located across from the Whalehead Club in the Corolla Light Town Center, we are easy to find, with plenty of parking. Bring Fido along as the patio is pet-friendly, or cool off inside (the AC is COLD!). We have plenty of room with enough tables for the whole family! Corolla Cantina is a casual and laid-back local favorite. You’re sure to love our menu: Mexican cuisine with a coastal flair. All of our salsa and guacamole is made fresh daily and is a delicious addition to any of our menu items, which include nachos, Baja fish burritos, sesame seared tuna, jumbo lump crab cakes, and our famous fish tacos! We also have plenty of vegetarian and vegan options! No matter the appetite, we have a little something for everyone. We have a pet-friendly deck, amazing staff and beautiful sunset and lighthouse views! So if you're looking for a true local experience, or just want to hang out and relax with a margarita in hand, come and check us out! Sit back, relax and enjoy one of our cocktails with your meal and let your Outer Banks vacation begin the right way! Corolla Cantina is open seven days a week for lunch and dinner. Remember to Be Kind and Unwind!! !